Lysimachos – King: 323-281 B.C. 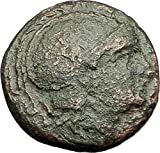 Bronze 18mm (5.24 grams) Struck in the Kingdom of Thrace 323-321 B.C. Head of Alexander the Great right, in crested Athenian helmet. BA / above and beneath lion leaping right spear head below.One of the most remarkable of the ‘Successors’ of Alexander the Great, Lysimachos was of Thessalian stock and was a bodyguard of the great Macedonian King. In the confused period following Alexander’s death he obtained the government of Thrace, and in 309 B.C. founded his capital city of Lysimacheia where many of his coins were struck. In 305 B.C. he took the title of King, and four years later extended his rule over much of Asia Minor following the defeat of Antigonos the One-eyed at Ipos. His later years were marred by domestic tragedy and his harsh rule made him unpopular with his subjects. In 281 B.C. Lysimachos, now aged 80, was attacked by Seleukos of Syria who was only two years his junior. Lysimachos died fighting at the Battle of Corupedium and his kingdom disappeared with him. But his memory lived on and generations later a number of mints in the Black Sea area restored his coin types for their autonomous issues.